Sparkfun.com has recently released a simple, easy and useful robot platform for robotics amateurs. It is called “Magician Chassis”. You can use the chassis for different kinds of robots, for example, line sensing, obstacle detecting and smart phone controlled robots. I have recently published an easy project about smart phone controlled robot. I have also used Magician Chassis on my project. 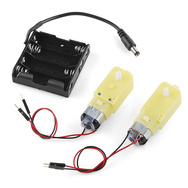 I recommend this chassis for robotics amateurs and novices because it is cheaper than other products I have known. You can use it for learning and experimenting the basics of robotics. How to assemble Magician Chassis? Step 1: You have two chassis boards, CHASSIS-UP and CHASSIS-BOTTOM. Put motor holders on Chassis-Bottom. Step 2: Connect speed holder with wheel rotator of motor and fix on the chassis-bottom. 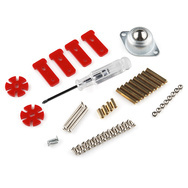 Fix the motor using M3*30 Screw and M3 nuts. 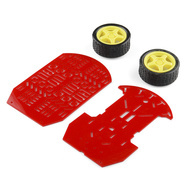 Speed board holder(RED) fixed with wheel rotator. Step 3: Fix another motor also on the chassis-bottom. Step 4: Now fix the wheels. Step 5: Assemble Omni wheel using M3*6 screw and L25 spacer. Step 8: Fix Chassis-up over the L25 spacers.